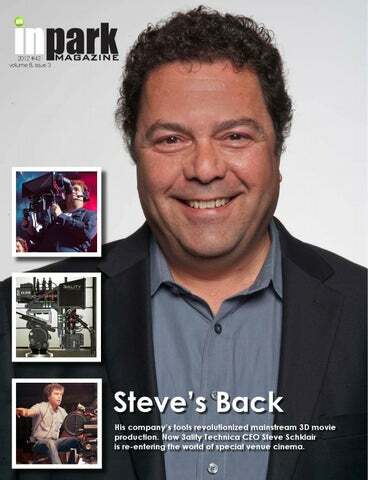 Steve’s Back His company’s tools revolutionized mainstream 3D movie production. Now 3ality Technica CEO Steve Schklair is re-entering the world of special venue cinema. Cover: Steve Schklair poses with insets of 3ality Technica equipment, in use and on display. In the bottom inset, Steve earns his stripes in the 1980’s behind a “vintage” camera. hile planning this issue, co-editor Judith Rubin commented that our foray into media based attractions was turning into a retrospective on the 1980’s. It’s true that so much of the current technology popular in parks and attractions really had its roots in innovations developed some 25 years ago. While I was just losing my baby teeth in the 80’s, others were cutting their professional teeth on new camera rigs, projection systems, ride films and new methods for storytelling. The work they did, borne out of the big movie studios, and nurtured by popular global expositions, laid the very foundation for the modern media-based attraction. 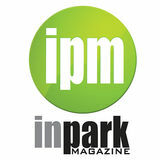 InPark Magazine (ISSN 1553-1767) is published five times a year by Martin Chronicles Publishing, LLC. 2349 E Ohio Ave. Milwaukee, WI 53207. Shipping address: 2349 E Ohio Ave. Milwaukee, WI 53207. Phone: 262-412-7107. Fax: 414-377-0769. Printing by MagCloud and Direct Impact. Contents © 2012 InPark Magazine. All rights reserved. Nothing in the magazine may be reproduced or used in any manner without the prior written permission of the magazine. InPark Magazine is not responsible for unsolicited manuscripts, photographs or illustrations. Such material must be accompanied by a self-adressed and stamped envelope to be returned. Postmaster: Send address changes to InPark Magazine 2349 E Ohio Ave. Milwaukee, WI 53207. Subscriptions are available annually for $30 per year ($40 international). Opinions expressed in editorial matter are not necessarily those of InPark Magazine or its publishers, Martin Chronicles Publishing, LLC. As we discovered, one Rubin, in 1987 cannot talk about the latest trends and technologies in this field without discussing this shared past, which comes up repeatedly in this issue. It also informs the future of our industry, and at the very least provides a signpost directing the way to go. The most successful in our industry have taken those historical lessons to heart and are charting a path forward to more exciting and innovative experiences. In fact, we are in a new “80s” period in themed entertainment now, in terms of the digital revolution and the tools therein. We are standing on the brink of a creative explosion that will be facilitated by that technology, and our industry creatives are only just beginning to realize its potential. Kongeparken, Norway (2012 Thea Award); “Beyond All Boundaries,” National World War II Museum, New Orleans (Thea Award, 2010); Volkswagen Glaserne Manufaktur, Dresden (Thea Award, 2002); and “World Song” for the USA Pavilion at Seville Expo 92. What were the great revelations for you working on pavilions at Vancouver Expo 86? There are several basics of Experience Design I learned while working with Bob Rogers at Expo 86, especially on the GM Pavilion [Spirit Lodge]. First, I learned we needed to control the show systems as well as the media. That meant we needed to control the architecture too. This upended the traditional mindset for everyone on the creative team: designer, producer, technical designers and architect. Second, the narrative must drive the visitor experience, and the message has to be clear, concise and to the point. Third, you must have the right team with the right combination of skills to turn the conceptual design into a successful story experience for audiences! The guests or visitors are the end users and we need to control all aspects of their experience, which meant we had to have a strongly developed story first, then design the attraction around it and have the right team in place to execute the project. These are the creative principles I’ve carried with me to the GW Group. You worked on the 4D museum experience Beyond All Boundaries for the National WWII Museum in New Orleans - a recent project quickly hailed as a new industry benchmark. Did BAB bring something new to the sensibility of 4D? Yes. Theater. BAB was done with The Hettema Group, and Phil Hettema really understands how to employ media in the service of theater and placemaking. He takes a complex approach to storytelling, weaving together many different elements of theater, architecture and design to create the environment and the experience. What have been some other milestone projects for you? The Volkswagen Gläserne visitors center was one. The concept included interactive touchscreens, and a projection dome that would deliver news updates. To pull it off in the mid-1990s was nearimpossible. The software didn’t exist. We found a company that aggregated news, and created a custom program. software, right? But CGI was then a much more complex and expensive process. We had no budget for that or traditional cel techniques - so we got introduced to the Macintosh computer, got a bunch of them, put people on them and said, “Animate!” And because we had a good team, we figured it out. Sophisticated media tools and a storytelling approach are adopted by museums partly with the goal of connecting with young audiences. Is it working? Keeping in step with modern modes of communication is only partly about technology. Is your “participation” reference akin to “gamification”? It is no longer solely the job of authors and creators and professionals to create the story experience. In the participation culture, you have the power to shape and change things yourself, exercising options to affect the way others experience the story. It’s a culture of empowerment, facilitated by the tools of empowerment. With gamification you’re still playing someone else’s game, by someone else’s rules. What’s your view on transmedia, a popular buzzword these days? Theme parks have always known that attractions based on IPs can generate substantial revenue. Movie companies are just now waking up to this and thinking about how to package and distribute their content across more platforms. Transmedia is not new; what’s new is the ability to get it out to more people in cheaper, easier ways. What most excites me about transmedia is the idea of creating a richer, more pervasive experience that incorporates multiple media platforms with placemaking to create a very textured story environment. What are you up to right now? We need to also look at the message itself, and convey that message in a participatory way. All too often, the story we are telling the young boils down to something like this: “The world we are handing you is really messed up, not as good as the one your parents and grandparents grew up in, and you’d better learn some science and technology so you can fix it all, or perish trying.” That’s a bit dismal for a young person looking forward to the future. Every generation is different. The generational changes of the last 10-15 years are huge, and I want to send a positive message about these youths of today. These kids are quite connected to the world, and they think it’s a pretty amazing place, even with its challenges. Their self-image is one of optimism and challenge and interest, and they deserve to be addressed with hope and optimism. risp, vivid images jump off the screen in 3-dimensional space that reaches the very tip of your nose as your body is bounced, shaken, poked, and even tickled in perfect unison with what you see. The action is further matched by well-timed spritzes of water and an amalgamation of aromas – all serving to completely immerse you into the story of the theme park attraction you are enjoying . . . or is it a theme park attraction? meant to be. Thanks to this technology, no longer are audiences asked to suspend their disbelief and accept that the flat, 2D image on the screen at the front of the cabin is, in fact, a window to the outside. This is a perfect example of how, rather than simply relying on 3D as a gimmick, the attraction subtly uses it to coalesce the overall story. Bryan Hinckley, Entertainment Development Manager at Electrosonic, a prominent AV systems integration company, recognizes the threats that theme parks face. “We are in competition with all forms of entertainment. The spread of 3D, [and now 4D] to homes and theaters is just another competitive element alongside mobile devices and social media.” But the advantage that theme parks have, Bryan explains, is that they can “take every experience to an extreme level by completely immersing visitors into the story.” Theme park budgets are unique in that they have the capability to push design aspects such as image and projection quality, screen size, and the integration with themed environments. “Technology has progressed so far in recent years that images can now be projected on almost any surface, of any size and shape. Advanced speaker design and audio processing allow sound to be controlled and focused to create complex and unique audio soundscapes. We constantly push the technology to meet the imagination of the designers. With a strong story, a unique environment, and creative use of technology, theme parks create experiences that you just cannot get locally or in your living room.” Of future media-centric attractions, one thing is clear: The days of media for media’s sake are behind us. Designers must delve as deeply into their technological toolboxes as they do their creative minds to concoct new recipes for experiences in which media is just one of many key ingredients. • • • George Walker (story.builder@ yahoo.com) is a creative consultant, show writer, and in-field art director who aims to strike a balance between innovative ideas and realistic build-ability. In addition to his writing for other projects, George was thrilled to have the unique opportunity to work this past year as a rock carver on Cars Land. George also sits on the Education Committee for the Themed Entertainment Association. Stan Kinsey Lifetime Achievement Thea Award from the Themed Entertainment Association (1997) and official Disney Legend honors (2009). Long before his name was put on the door at Iwerks Entertainment, Don had iconic status from his 35 years at Disney Studios, which included 20 years as head of the Disney Studio Machine Shop developing special cameras and projectors for Disneyland, Walt Disney World, Epcot and Tokyo Disneyland. Don’s father, Ub Iwerks was likewise a unique, legendary Disney artist, animator and innovator whose contributions are chronicled in “The Hand Behind the Mouse” documentary and book by Don’s daughter Leslie, herself an accomplished filmmaker/author. Neither Don Iwerks nor Stan Kinsey is part of the company today, although both are still active in their fields. But the rich legacy is upheld in the successes of the present company, SimExIwerks. In 2000, Michael Needham joined the resources of his firm, SimEx, to the assets of Iwerks Entertainment. Iwerks was by that time debtridden after a turbulent, downward business trajectory following a blockbuster IPO in 1993. Company resources had been drained by a long, competitive battle with Imax Corp. for a share of the 1570 giant-screen projection market. Brands in the SimEx-Iwerks library include Yogi Bear, Dora & Diego, Looney Tunes, Ice Age and more. Posters courtesy of SimEx-Iwerks. development, and co-ventures with zoos and aquariums. “The company leaders are good businesspeople who recognized our true market niche,”says Scott Shepley, Vice President, Film PostProduction, who started at Iwerks Entertainment more than 20 years ago and has remained with the company through all its transitions. SimEx-Iwerks has its corporate headquarters and manufacturing in the Toronto area, with a base in Southern California, another in Baltimore and satellite offices overseas. Company revenues are about $30 M (USD), growing at the rate of 8%10% a year for the past 5 years. content for the company’s global network of 4D and motion theaters. Like Scott Shepley, he’s been with the company some 20 years. Current titles include “Ice Age 4D” (Fox); “Yogi Bear 4D” and “Roadrunner 4D” (Warner Bros.); “SpongeBob SquarePants” and “Dora & Diego” (Nickelodeon) and “Planet Earth” and “Frozen Planet” (BBC). A seasonal favorite is “Polar Express 4D” (WB). Iwerks Entertainment’s primacy in the Asian market also proved hugely valuable. “They had been very early into Asia,” says Needham. “Because of that, SimEx-Iwerks was well positioned in what has been the most buoyant marketplace of the last 10 years.” Mike Frueh cited former Iwerks employee Don Savant (now head of Asia-Pacific theater development for Imax Corp.) for his groundwork in Asia. “If a recession hits, nothing is going to rescue you other than a marketplace where there is not a recession. Asia has been that for us,” adds Needham. Iwerks TurboRide Theater markets in Asia included Taiwan, Indonesia and mainland China (an anecdote about one installation has former operations manager Doron Golan hastily arranging with a local tablecloth factory to replace a torn screen). Virtual Adventures was a 1993 collaboration between Iwerks and Evans & Sutherland to create real-time, multi-user simulation. The windows of the ride vehicle were computer monitors that displayed the real-time results of the vehicle’s navigation through digital databases loaded onto multiple E&S image generators. The cost of such technology was much higher than it is today and was one of the factors that kept VA from progressing beyond the first few installations. It won eight awards, including the first ‘Best Virtual Reality’ award from the Academy of Interactive Arts & Sciences. “There’s a lot of Virtual Adventures in today’s platform games,” comments Newquist, “- in how they are designed, and the concept of what gameplay is. We decided, with VA, to have some stopping points with canned media to help fill in the story and provide closure - and that is a standard for all multiplayer games.” Michael Dulion (former VP of Operations with Iwerks Entertainment; now a business consultant) remarked, “VA was without a doubt the most advanced technology that Iwerks developed. Stan was in charge of the concept and I led the team developing the technology, which included Eddie and Kirsten Newquist, Celia Pearce and Mike Hamison for Iwerks and a team led by Mike Ryder at E&S. Together the two companies probably spent between $7 M and $10 M on the development.” An Iwerks-Minolta collaboration that helped advance planetarium projection was the 12k 70mm fisheye film system. This 870, 12,000-watt, partial-dome film projection system could share space with a starball projector. According to Bob Chambers (former project engineer at Iwerks): “It often had to be positioned downstage or upstage because of the starball, making lens distances tricky.” The projector rose into position via elevator. Chambers caught the entrepreneurial spirit at Iwerks; he founded his special effects company, It’s Alive in 1995 and with Edward Marks recently set up a new business, The Producers Group, which boasts Don Iwerks on its advisory board. intermediate step of film or TV adaptation and jump straight to an attraction instead. I could see the same thing happening to other properties like Halo, Super Mario Bros, The Legend of Zelda, Spyro, etc. where the price of the content and hardware is dropping and the quality is rising. The price of other aspects of attraction production (scenic production and ride systems) are relatively flat compared to media. We will also see faster updating to media based attractions. With the success of the Despicable Me: Minion Mayhem, once again Universal Orlando has demonstrated how an existing media based attraction can be transformed into a completely new guest experience: Take the existing hardware and facility, rebrand it, re-skin it and swap out the content. This black box concept is the future of media based attractions. ver the course of the last two decades, branded media based attractions have made the headlines as groundbreaking creative and technological wonders. Examples such as Spider-Man, Harry Potter and Transformers (Universal Studios parks) and Star Tours - the Adventures Continue (Disney parks) indicate that media based attractions are pushing toward delivering the true immersive experience. With the overwhelming financial and guest satisfaction success of these attractions at major destination parks, we would like to see smaller park operators following suit and are surprised it hasn’t happened more, especially in the US. Asian parks appear to have embraced the idea of media based attractions as a part of nearly every new master plan, even at smaller parks. Integrated media attractions are part of the equation. We’d like to encourage that media based attractions be discussed more at capital expenditure meetings in the US regional market. Why? The cost of upgrading a theater to the latest in digital 3D is a fraction of the price of a new roller coaster. Even a new theater with a custom branded film would cost far less than most of the steel going into parks. The basic media based attraction – 4D theaters - have a scale-able capacity. Based on the amount of theaters, seats and the film length the 4D theater can be configured to fulfill any capacity need. This is a concern for owners and operators. After a guest sees a 4D show or another linear media based attraction, will they line up to see it again? The newest generation of 4D experiences is being designed with this in mind from the beginning. The basics of a fun and unique story are great characters, great action and great humor - in addition, the guest should have opportunities to feel he or she is part of the action, rather than just an observer. More specific and sophisticated methods are being developed for the current and next generation of attraction media to create more repeatable, interactive, immersive experiences. •Different versions - Many park fans will ride a favorite attraction over and over again. The ability to create media that provides a new variation on the experience each time, through different scenes randomly selected, incorporating audience members’ likenesses or avatars, or other digital options now available, enhances and rewards this repeat visitation. The recent refresh of Disney’s classic Star Tours attraction is a great example. •A penchant for detail and trivia - The richer and more dense the world and action therein, the more repeatable the attraction becomes, as fans are drawn deeper into the layers of the experience. Fans will look for and share special hidden details - this activity has exploded over social networks - as a way to convey their familiarity and knowledge of the experience. TurtleTrek at SeaWorld includes background details, like a plane flying overhead, and party-ers in a house in the distance that one may not see on the first viewing, but starts to become apparent on subsequent visits. •Mobile apps – Making use of guests’ smartphone’is another way to supplement the experience and make it engaging. Apps can present an extended experience unique to the attraction so guests can essentially take it home with them; they can also be used to spark interactions between guests and reinforce the shared experience that is one of the defining factors of out-of-home entertainment. •Seasonal and custom content packages – Seasonal overlays include media developed for specific holiday and seasonal programs. Disney’s the Magic, the Memories and You! shows all are updated regularly for each season, and digital media has made this kind of customization simpler than ever. Customization can similarly be applied for special events and corporate presentations. or offer enough choice. Original content can be expensive to create, and challenging to market. Branded content can be a complex world of rights, territorial exclusivities and finances. These factors have created a perceived barrier to entry by the regional parks. However, the expansion of the branded media market has opened doors to bring quality content within the reach of regional parks. Deals are coming together with such major content suppliers as Dreamworks, Nickelodeon, Fox, and Warner Brothers actively pursuing the theme park and recreation markets. Supply and choice of premium content are now able to meet the demand. Seasoned distributors that can bridge the mainstream and specialty markets, such as SimEx-Iwerks, nWave Pictures and Attraction Media & Entertainment have a range of products to meet the demand of different creative market categories and demographics. Producers and distributors of all stripes are seeing the advantage of packaging their content for a wider range of media platforms, facilitated by digital tools. And we’re also seeing a number of mainstream producers and directors take a direct interest in creating shows for special venue media, further enriching the library of available quality content. Luc Besson’s “Arthur 4D” attraction for Futuroscope Park is one example. t the Themed Entertainment Association Summit last March, I was pleasantly surprised to run into Steve Schklair, well-known as the CEO of 3ality Technica, developer of sophisticated technology behind the 3D boom in television and feature films. Steve’s roots are in special venue cinema, and when I first knew him in the late 1980s he was running Infinity Filmworks with director Keith Melton, producing innovative media pieces such as Sensorium for the Baltimore Power Plant. (Keith still runs Infinity, and the two are still good friends.) Steve moved on to work in visual effects, video game production and more, always positioned at the point where creativity and new technology converge and always, through his vision and contributions, moving that crossroads forward. His company 3ality Technica is a reflection of that - about half of its 100 employees are engineers and half are creatives. has built its broadcast capture infrastructure on 3ality Technica technologies and methodologies. The company has deep relationships with major studios, top directors and gear manufacturers and a thorough knowledge of production culture and practices. So what was Steve doing at the TEA Summit? Why does a film industry CEO decide to take the temperature of the attractions industry? Because he’s never lost his attachment to special venue production and its unique creative challenges. Steve Schklair is back to shake things up, ladies and gentlemen, and he’s bringing the 3ality Technica 3D toolkit with him, plus a wealth of relationships and other resources, and creative fire in the belly. -- J.R. What do you like best about special venue production? Do you want to get behind the camera again? New challenges, creative satisfaction and some creative control: special venue offers the opportunity for all of those. I was born a cameraman. I shot Sensorium and all those early projects with Infinity Filmworks. I wouldn’t mind getting behind the camera again, but I get the same kind of creative satisfaction from solving the technical and logistical problems of unique productions. I want to find a good project and take it on. Hopefully it will be something very new and cool that’s never been done before. I love the work we do supporting features such as The Hobbit, but it’s not our movie; we play an advisory role. In special venue, you get to participate more in the filmmaking process, and then you get to go work on the install, too - to design components for the theater that do new and cool things. It’s where my heart is and it is always innovative and fun - it’s great to tell a story in a 12- to 14-minute format. 3D features we’ve been involved on - for none of those has the director had to wait for the 3D cameras to be tweaked before every shot. The tools we’re using today have zero to do with the tools we used to use when I was in the special venue business in the ‘80s and ‘90s. Live action 3D is no longer among the dark arts. What are the key tools? The 3D rigs and the Stereoscopic Image Processor™ (SIP) are the crucial ones. The new 3D rigs shoot very, very high resolution and can be hand-held, or run on a Steadicam or the end of a jib arm. They can go anywhere and are 10 times more capable than those big old hunks of metal we used to rely on for live action 3D shooting. For special venue nowadays you’d go with RED Epic cameras that shoot 5K; the rigs and cameras are wireless so the Steadicam operator can run free and move fast. They also have more motors and axes of motion than the old ones, which is important because you can align them remotely. In the past, camera alignment and weight have been the biggest problems for special venue 3D shooting. Ridley Scott with 3ality Technica 3D camera/rig systems with RED Epics on the set of “Prometheus” ©WBC | ZoomWerks, Los Angeles parks could, for example, simulcast or play back live shows in 3D, especially if they have brought in major musical talent. Speaking of major musical talent, tell us about the U23D movie, produced by 3ality Technica. U23D was the first live-action 3D film shot digitally and put into theaters. I would say it was more of an art project than anything else, along with a proof of concept. I had theories that audiences could be comfortable watching 3D for 2 hours, not just 12 minutes, and it was a chance to put those theories into practice. We used effects that nobody had ever before done in 3D, and it was a huge breakthrough. 3ality Technica is represented by ICM. Will that be utilized in pairing your company with special venue projects? It will support the endeavor. If we need access to talent, to top directors, we can reach out through ICM, as well as through our own established relationships. In conversations with features directors, I find that most of them are interested in special venue. It appeals to them because of the shorter length and as an opportunity to do something different. fundamentally altered their audiences. It’s clear that a massive generational shift in audience expectation has been rippling through every facet of consumer design for the past few decades, yet in themed entertainment & location-based design, gamification seems to still be in its infancy. That’s mainly due to momentum – our brickand-mortar products take a while to get to market, so adopting new technologies and philosophies can be a slow and meticulous process. However, location-based attractions offer a unique combination of social activity, spectacle & environment that you can’t get from a game console, tablet or smart phone. Our projects are unique walled gardens, where group interaction and engagement is already part of the experience – creating a massive opportunity for our industry to experiment and innovate with gamification techniques. In many ways, “gamification” is this decade’s term for “interactivity” – something that attractions have been adding in small doses for quite some time now. Theme parks took early steps into gamified experiences with “shoot-em-up” videogame-style rides like Universal Orlando’s Men in Black: Alien Attack, Disney’s Buzz Lightyear Astro Blasters & Toy Story Midway Mania, and Sally Corporation’s many interactive dark rides at smaller parks around the world. The simple addition of accumulating a score while you ride made these experiences extremely repeatable, and the simple “shooting-gallery” game mechanic made it accessible to gamers and non-gamers alike. But shooting galleries are only one kind of game, and it’s only the beginning for where themed entertainment is headed. Two recent projects from Thinkwell are good examples of how gamified techniques can be used within location-based environments. shells, eggs and fossils reveal what they’ll grow into when placed in front of a magic mirror. And everything designed into the environment is species-accurate to the region, down to the last leaf on every tree. It’s not all about technology, either; instead of the traditional printed descriptions, Thinkwell created scavenger-huntstyle “challenge cards” for many areas of the exhibit. The cards promote active conversations between parent and child as they discover the environment together. While low-tech in nature, these cards can be said to make the entire space “gamified” by virtue of their being infinitely “reprogrammable” to suit such parameters as the visitor’s age or grade level, or the time of day or the season. Gamification has taken hold in other traditional forms of location-based entertainment, as well. UK-based theater production company Punchdrunk has gained accolades and notoriety (most recently off-Broadway in New York City) with its hit show Sleep No More, an immersive retelling of Macbeth mashed-up with a 1930s film-noir Hitchcockian setting. The audience doesn’t watch from afar – they are literally thrust into the experience, following a cast of 20 through five floors and over a hundred rooms, blurring the line between space, performer & spectator. The action is overlapping, non-verbal, and non-linear; the audience members follow the action & characters at their own discretion, wearing masks that give them social permission to be completely silent, identity-less voyeurs. In effect, Punchdrunk has gamified Shakespeare into a participatory piece of choreography where no two viewers ever have the same experience, and it’s up to the audience to piece together the emotional narrative. David C. Cobb is Senior Creative Director at Los Angeles-based experience design firm Thinkwell (www. thinkwellgroup. com, Twitter @ ThinkwellGroup); you can follow him on Twitter @ davecobb. Play to win at IAAPA Attractions Expo 2012. Come to Orlando and: s  3EE THE INDUSTRYS LATEST  INNOVATIONS s  4AKE AWAY AMAZING IDEAS  FROM NEW EXPERT SPEAKERS  s  #ONNECT WITH MORE THAN    INDUSTRY PROS s  0ARTICIPATE IN EXCLUSIVE   BEHIND THE SCENES TOURS  So join us in November, and keep your business on the winning path. IAAPA members save up to 40% on registration.